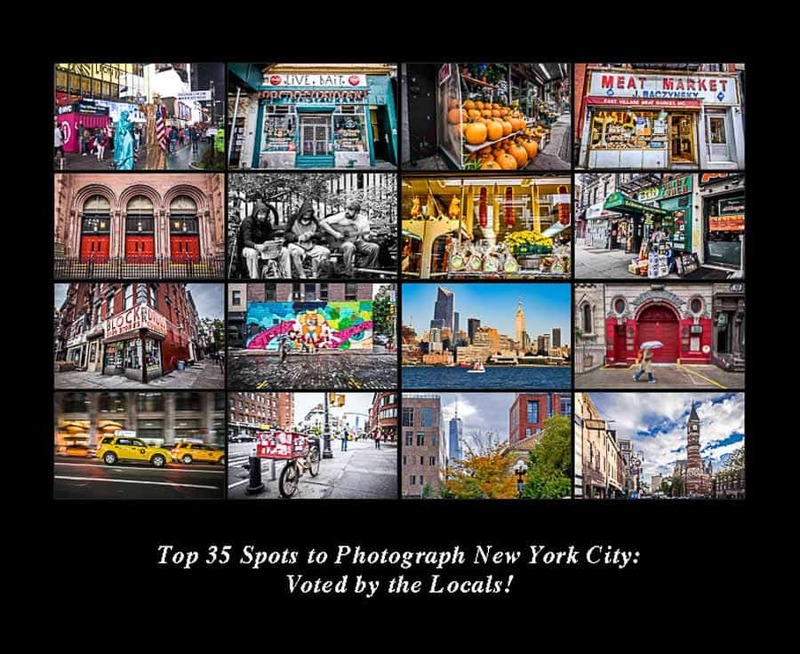 Top 35 Spots to Photograph New York City: Voted by the Locals! I'm not sure what I was thinking when I decided to write a photographer's guide to New York City. Maybe it's because I've always been kind of intrigued by big cities. Being from the Midwest, in the middle of farm country, where the nearest grocery store is 10 miles away and being stuck in traffic means there is a slow-moving farm vehicle ahead, can do that I guess. But really, the 9th largest city (by population) in the world? By the way, that ranking varies depending on where you look. But the Big Apple is, indeed, BIG! I had always wanted to visit New York, just to see what it was like. That's especially true since really getting into photography. It seemed that the change of scenery would be a good thing and the shooting opportunities there are endless. Not to mention, I think it is a great idea to step out of your comfort zone now and then and shoot something completely new or different to you. 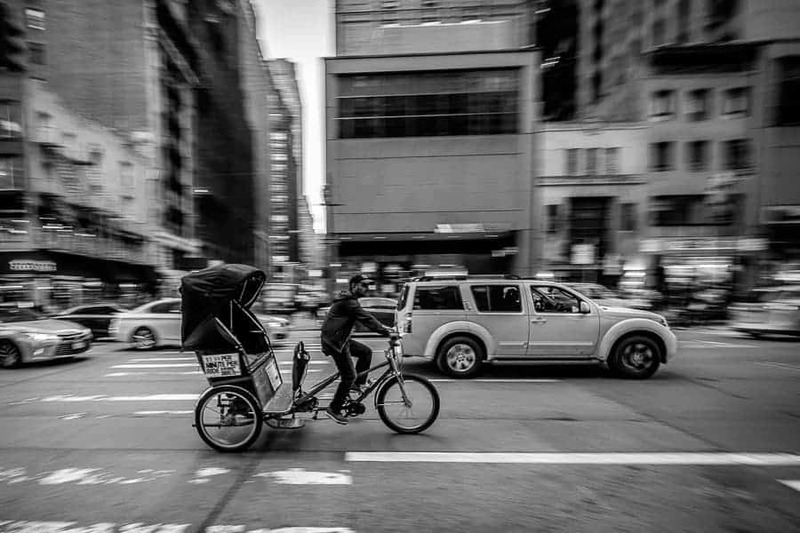 I had the fantastic opportunity to travel to New York City for a few days in early October, which undoubtedly provided some great photographic challenges. 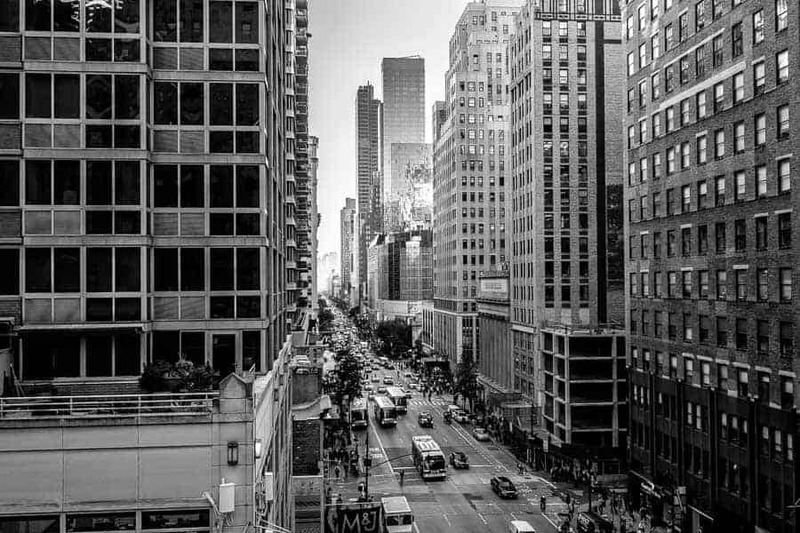 The view down 6th Avenue from the roof of my hotel. Photo by author. This article is somewhat obsolete now. 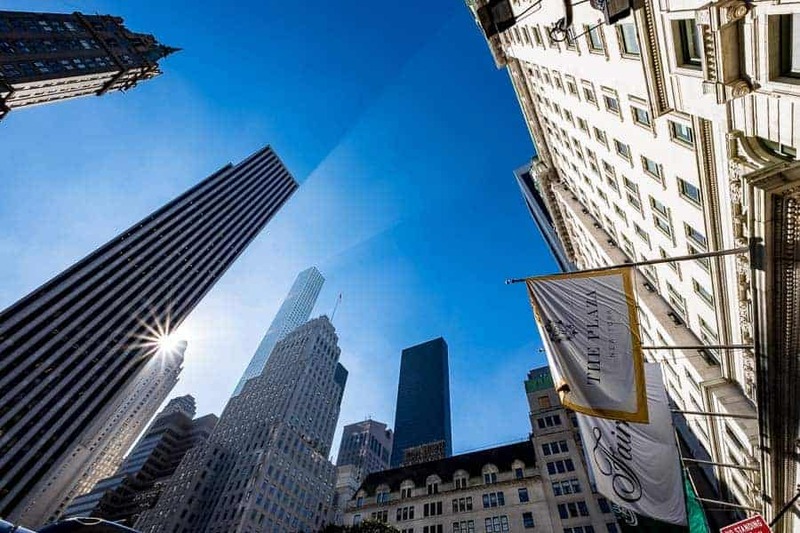 Since posting this article a year ago, we released an iPhone/iPad app of all the best places to photograph in New York City (and around the world). It' s a free app called Really Good Photo Spots and you can download it right here. All of the spots in this article are in the app, but also there are MANY MANY more in the app than in this article. Before moving into the photo locations, there are a few things that should probably be clarified. This is obviously not going to be an exhaustive list of all places to photograph New York City. As was previously mentioned, this is a big city. There will be locations that are left out. I encourage readers to add places that were missed in the comments below. That would be helpful to everyone, but especially those who are visiting for the first time. 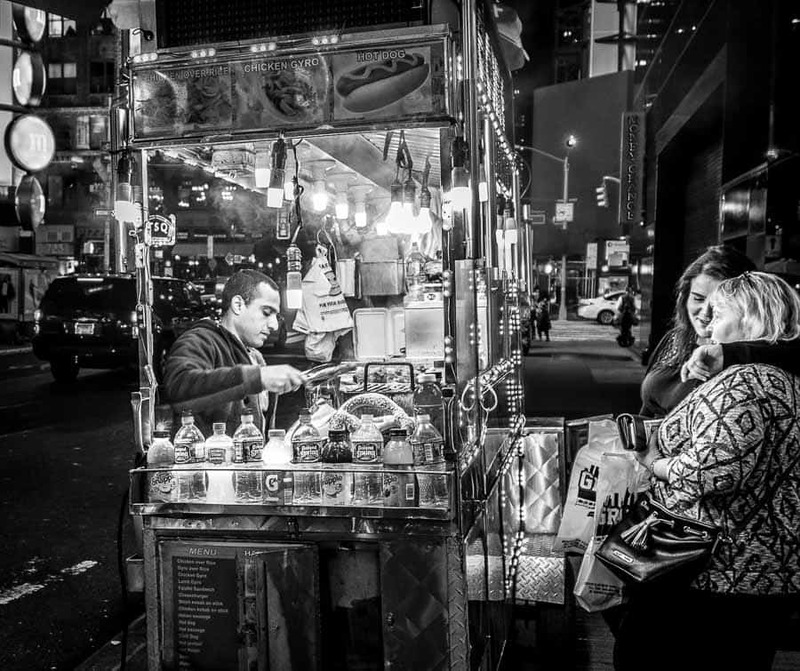 As the title implies, I wanted to get as much input as possible from anyone living in or near New York City. After putting out requests for photo locations on the various Improve Photography Facebook pages, I did take the liberty to add a couple of my own. The photo locations in this article aren't going to be hidden, super-secret places. They are some of the familiar high points (some literally high points) to shoot if you are ever there. You'll notice that most of the locations are in the borough of Manhattan; however, there are a few from the surrounding areas. For ease of use and to help with planning out an itinerary, the photo locations are separated into groups based on the neighborhood or area in which they are located. One of many modes of transportation in the city. Photo by author. As the name implies, Midtown is basically in the middle of all the action. It is the largest central business district in the world and the largest commercial, entertainment, and media center in the US. There is a lot going on here. It's a great place to stay to be centrally located for the surrounding things to see and do. You can't miss the Empire State Building, since it is one of the most familiar landmarks in the City. It's kind of tall, too. In fact, it was the tallest building in the world for 40 years, until being surpassed by the World Trade Center in 1970. It seems like this building is visible no matter where you go. 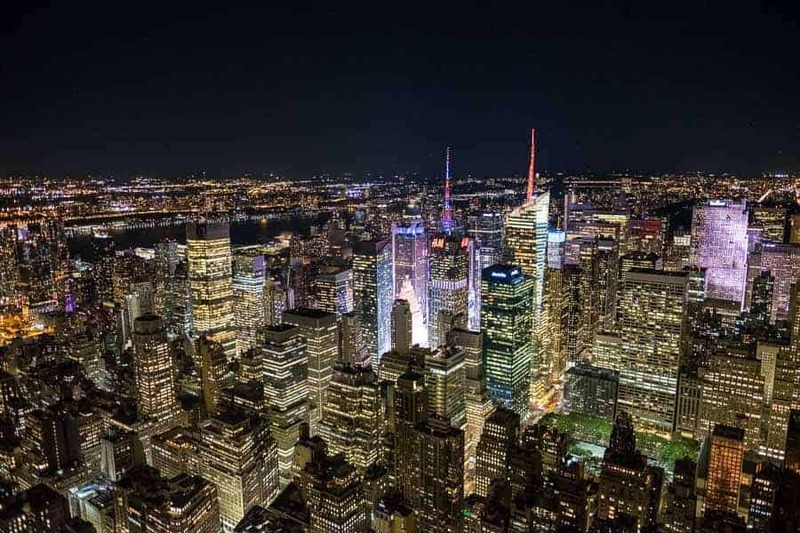 There are some fine images to be made from numerous vantage points, whether as a city skyline shot or an image of the building looking up one of the busy streets. One of the more popular attractions is to go up to one or both of the observation decks for 360 degree views of the city. The first observation deck is on the 86th floor. You will have to shoot through a steel protective barrier, but there is plenty of room to shoot through. The upper deck is on the 102nd floor and is enclosed with glass. Note that tripods are not allowed, so you'll need to use good technique if shooting at night. Also, be prepared to wait in line, as this is a popular stop for visitors. I highly recommend the VIP Express Pass. It's kind of pricy, but we saved ourselves at least 2 hours of waiting. The Chrysler Building was the tallest in the world before the Empire State Building. Architectural shooters will really enjoy the Art-Deco style of this building. It's difficult to get much of a shot of the exterior from up close because of the height and the proximity of surrounding buildings. Therefore, try some shots from a block or two away to get the building's unique styling and spire in the image. The entrance to the building is a work of art as well. Step inside the lobby to capture a piece of history. Don't forget to look up at the amazing artwork on the ceiling. 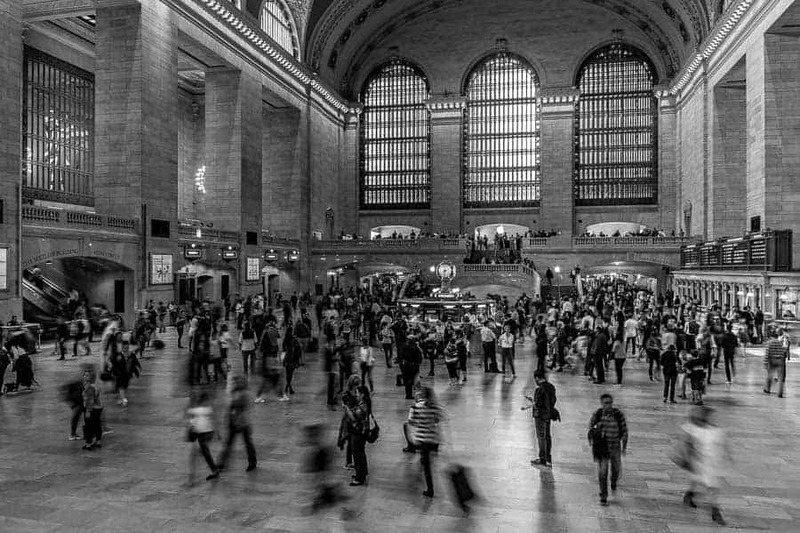 Grand Central Terminal is an amazing building, inside and out. There's a reason it is one of the world's most visited tourist attractions. That means lots of people! Not to worry, though. If you can get a good spot from above the main floor, drag the shutter a bit to show the commotion below. Tripods aren't allowed, but you should be able to use a Platypod Pro. If you want fewer people, try going late at night. The terminal is open until 2 AM. Capturing motion inside Grand Central Station. Photo by author. The New York Public Library, located at 42nd Street and 5th Avenue, is the second largest library in the United States. The massive building, with its intricate architecture, is something to behold on the exterior. However, you really want to go inside to see a real work of art. Unfortunately, I was not able to get inside during my visit in October due to the library being closed for renovations. New York Public Library. Photo by author. Since you're already in the neighborhood visiting the library, check out the adjacent Bryant Park. This small oasis in the midst of skyscrapers is located above a subterranean structure that houses the library's stacks. The park has a storied history, and has a nice fountain, green space, and plenty of people-watching and photographing opportunities. Times Square probably doesn't need much of a description. It is another of the world's most visited attractions, and certainly worth a visit. If you go at night, which I would recommend, the lights from the electronic billboards light up the area like daytime. Be prepared to see a LOT of people. There are a number of street performers as well as many, shall we say “characters”, in various states of dress (or undress, as the case may be). There is never a dull, or quiet, moment here. It's difficult to capture the energy and feel of this place in a still frame, so I set up my Platypod and shot a time lapse. The craziness that is Times Square. Photo by author. Rockefeller Center is a complex of several highrise buildings, including 30 Rockefeller Plaza, the original Time-Life Building, and Radio City Music Hall. There is no shortage of historically significant structures and incredible architecture to photograph in this area. On the roof of 30 Rockefeller Plaza, 70 floors up, is this amazing view of the the city. To the south is a great view of the city with the Empire State Building the prominent structure. Looking to the north is a fabulous view of Central Park, a sea of green bounded on all sides by urban life. Tickets to the top are $34 each. Be sure to go late in the day to catch good light and sunset color. There are number of old churches and cathedrals around New York City, but St. Patrick's Cathedral may be the most prominent. When construction was completed in 1878, the cathedral was the dominant structure in the area. It is a Neo-Gothic style cathedral and is an architectural marvel. The day we happened to be visiting, a Columbus Day service prevented us from going inside. 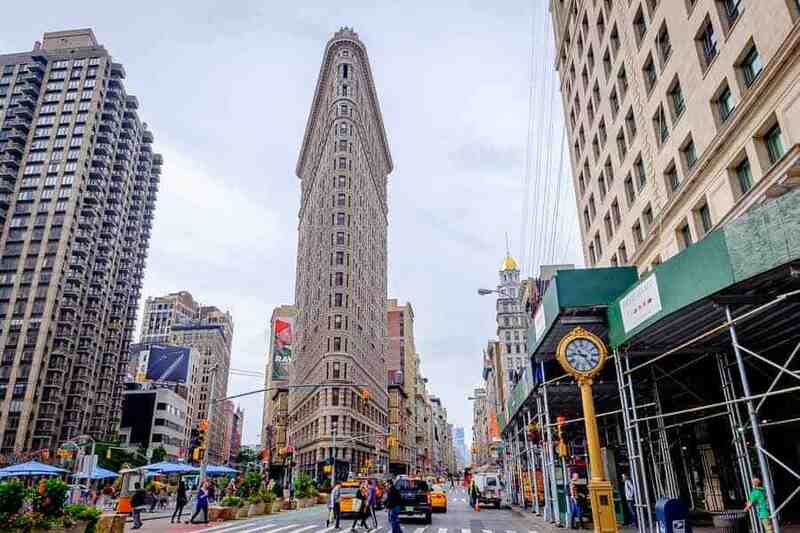 The Flatiron Building is a unique, triangular-shaped, 22 story building located at 175 Fifth Avenue. When construction of the building was complete in 1902, it was considered to be a groundbreaking skyscraper and one of the tallest buildings in the city. It was designated a National Historic Landmark in 1989. Due to its unique shape, the building has been popular among photographers and artists since it was constructed. The Flatiron Building. Photo by author. The High Line is a 1.45-mile linear park build on an elevated section of a disused New York Central Railroad spur. The park has a number of natural and cultural attractions and also offers interesting views of the city and the Hudson River. Like so many other locations on this list, Union Square has historical significance and a storied past. It essentially served as a town square at the intersection Broadway and 4th Avenue. The square has served as home base for countless community events, from the first Labor Day parade in 1882 to the first Earth Day in 1970. The former town square has transitioned into a city park, with statues of several distinguished historical figures. You will also see a wide variety of people participating in anything from protests, chess playing, to feeding the local wildlife. If you enjoy people photography, this is the place for you. 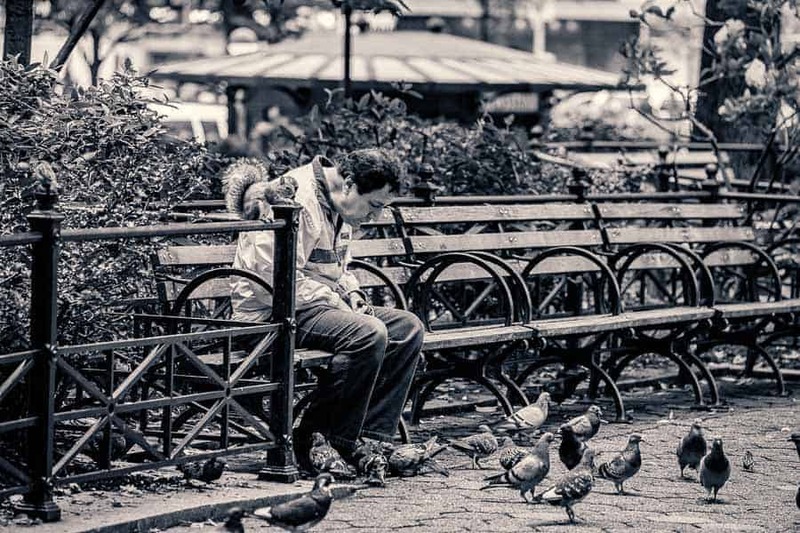 Feeding the birds at Union Square. Photo by author. Lower Manhattan, with the familiar landmarks such as the One World Trade Center and New York Stock Exchange, is the main financial center in the US. It is also very rich in culture and diversity, with a variety of unique and interesting neighborhoods. There is no shortage of people, places, or things to shoot in the area. To call Greenwich Village an eclectic neighborhood would be an understatement. Known simply as “the Village” to locals, this is a great area to just wander the sidewalks and soak up (and photograph) the diverse people, shops, and restaurants. As is the case just about anywhere in the city, you'll see plenty of interesting architecture as well. You may even want to head up Bleecker Street where many popular nightclubs, music venues, and comedy clubs reside. 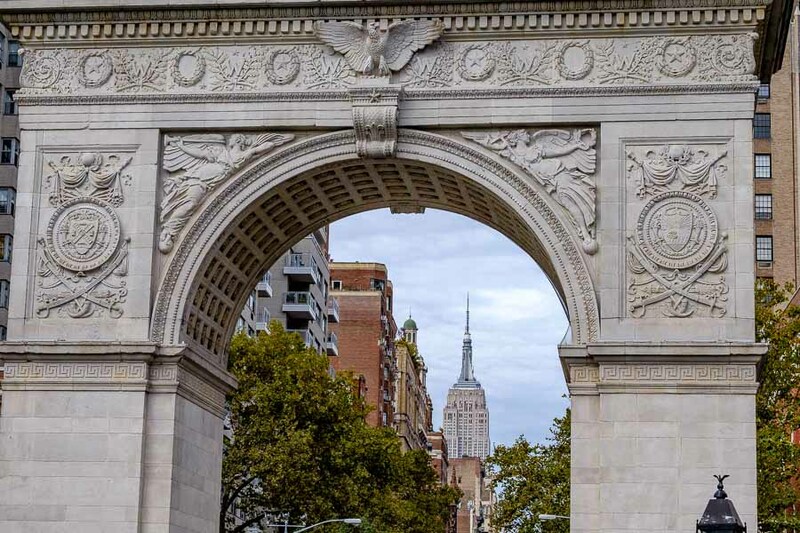 While in Greenwich Village, make a stop at Washington Square Park. Located in the heart of The Village, it is one of the best known of New York City's public parks. 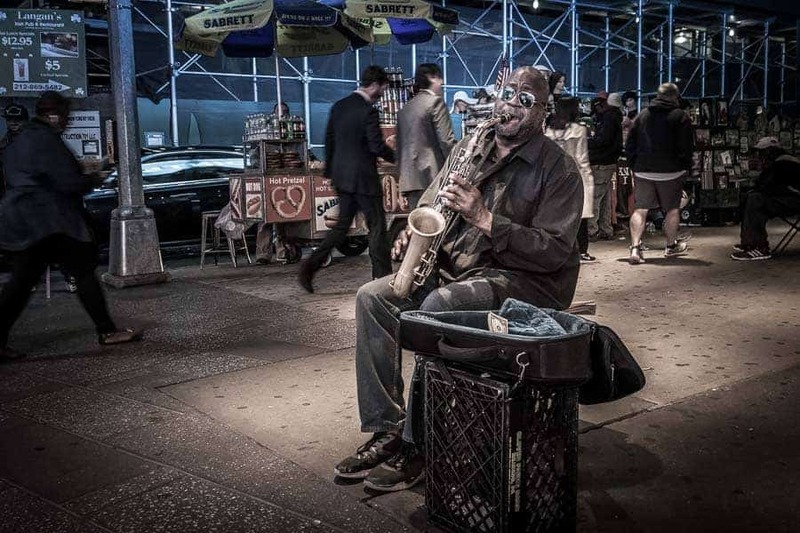 In addition to Washington Square Arch, which dominates the park, you're bound to see musicians and other street performers in this center for cultural activity. Through the Washington Square Arch. Photo by author. Although the Italian American population is not what it once was here, there is still no shortage of Italian-influenced culture in this quaint little neighborhood in Lower Manhattan. The outdoor cafes, as well as the colorful buildings and personalities offer plenty of street photography opportunities. Plus you can get some pizza, which is always a good thing. Stepping into this neighborhood, located immediately south of Little Italy, you'll notice an immediate transformation. The streets and sidewalks are bustling with activity, as people hustle through the markets and shops to live out their daily lives. 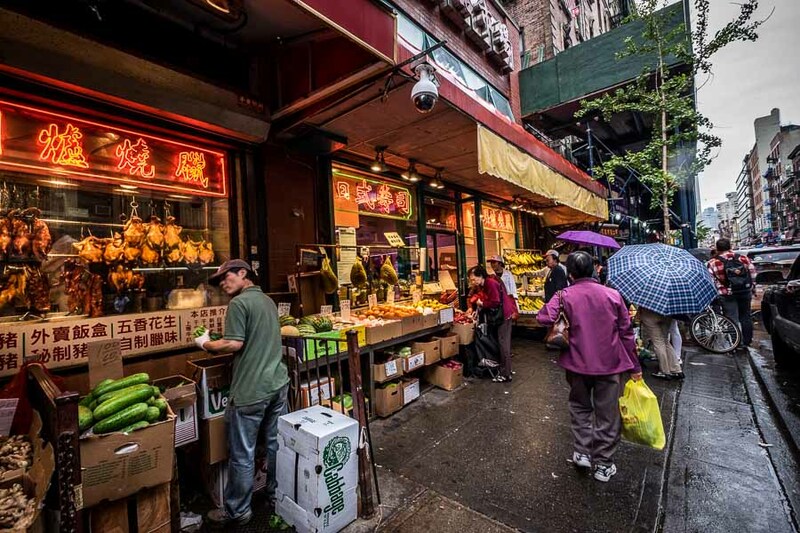 This is the largest enclave of Chinese people in the Western Hemisphere, with an estimated population of 90,000 to 100,000 people. This is a great place to make some new friends as you capture some of the interesting shop owners and their wares. One World Trade Center is the tallest building in New York, and the sixth tallest in the world. It is an engineering marvel and undoubtedly an impressive sight to see. There are many vantage points from around the city to capture images of the building, but its massiveness is really revealed as you get closer. Tickets can also be purchased for $34 for access to the observation decks on levels 100, 101, and 102. I didn't have a chance to go up, but it would sure provide some amazing views of the city. A rainy day at One World Trade Center. Photo by author. The site of the World Trade Center terrorist attacks of September 11, 2001, this is a somber reminder of those dark times in American history. 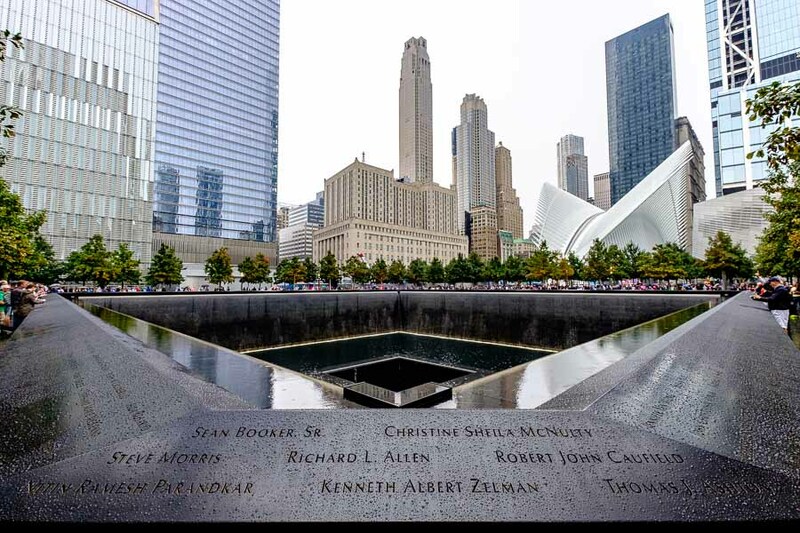 The footprints of each of the towers have been converted to reflecting pools, surrounded by a bronze parapet with the names of each victim inscribed. You may or may not find it appropriate to take photos here, but it is a must see if you ever visit. There is also a memorial museum to learn more about the history and the events leading up to that tragic day and the efforts to rebuild. 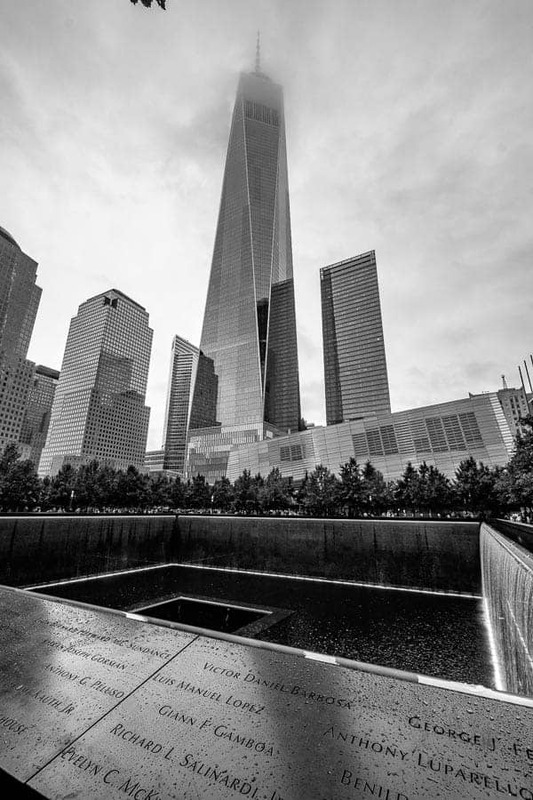 The 9/11 Memorial. Photo by author. Battery Park is a 25 acre park located on the southern tip of Manhattan Island and looking out into New York Harbor. The park is so named because of the artillery batteries that were located there in the 17th Century to protect the seaward approach to the city. There are plenty of historically significant structures and some nice views of the harbor to photograph. The Statue of Liberty is visible, but would still require a long lens to get in close. One could probably spend an entire week just exploring Central Park and photographing the interesting sights. The 843 acre park is not only the most visited urban park in the United States, it is also one of the most filmed locations in the world. A stroll along many of the walkways and bridges will likely bring back memories of scenes in movies. It is difficult to narrow it down to just a few places, but here are some favorites. As you enter Central Park at West 59th Street and 5th Avenue, you'll soon see The Pond and the famous Gapstow Bridge. It this scene looks familiar, it's because you've probably seen it in a few movies. When I was here in October, I found myself looking for the spot where Kevin encountered the bird lady in Home Alone 2, but I believe that was elsewhere in the park. 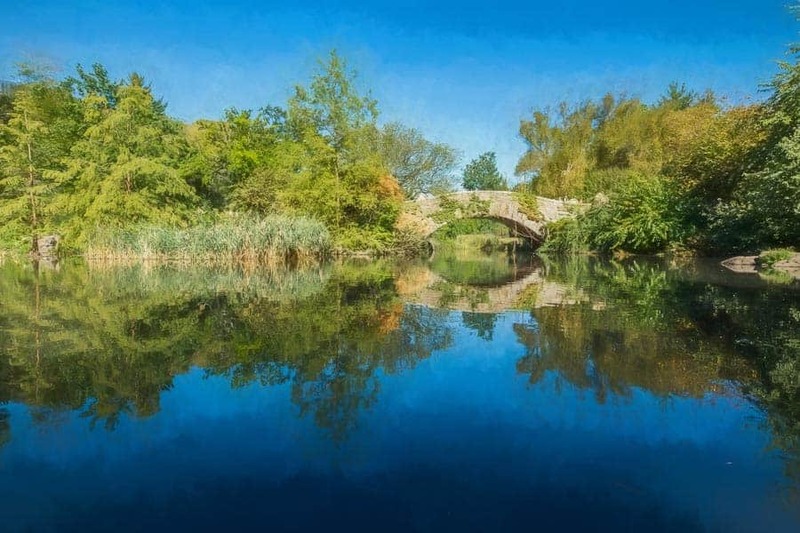 Gapstow Bridge is a stone arch bridge spanning the narrow finger at the north end of The Pond. You can frame up some nice photos from several locations along the pond bank that include the bridge and even some of the city in the background. Facing south, the famed Plaza Hotel (where Kevin ran up that huge room service bill) is visible over the trees and pond. This location is really beautiful in the midst of such a large city. Best times may be in the fall when the leaves are changing or even in the winter with a light dusting of snow on the landscape. Gapstow Bridge in Central Park. Photo by author. Interestingly, this is Central Park's most important horticultural feature. This is due to the amazing rows of American elm trees that line this pedestrian walkway. Although the southern end of The Mall, known as the Literary Walk, has statues of some important writers, the most dramatic photographs are made by using the trees and the walkway as leading lines. The trees form a cathedral-like canopy above and are one of the park's most photographed features. I've seen photos taken in all seasons and each has its own unique flavor. Take a walk and enjoy the serenity in the middle of the urban jungle. There are some interesting shots to be had at this location. At the north end of The Mall is Bethesda Terrace and Fountain, which overlook Central Park Lake. The terrace is a fascinating display of stone artistry, with intricate carvings and paintings. This is a great place to visit in the park and offers a wide variety of photographic opportunities, from people to architecture, or even landscape. 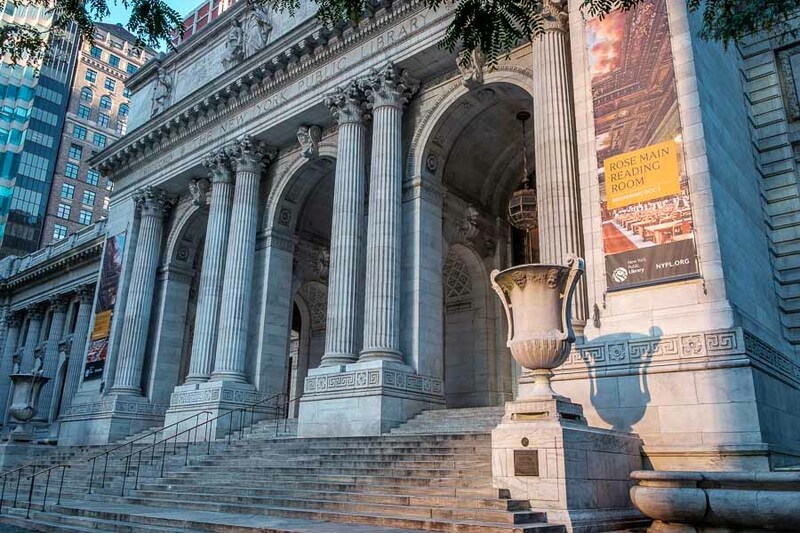 The Metropolitan Museum of Art is located along 5th Avenue, about half way through Central Park. The museum contains one of the world's greatest collections of ancient to contemporary art. The building itself is stunning, both inside and out, and would appeal to anyone who enjoys architectural photography. A walk through the exhibits, although maybe not providing much photographic opportunity, may be a great way to tap into your creativity by viewing artistic masterpieces. The famous Plaza Hotel (not where I stayed). Photo by author. 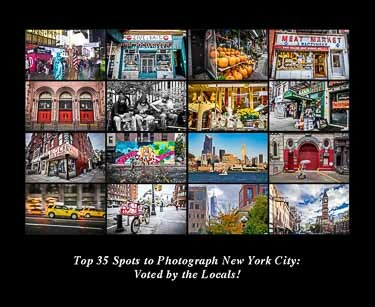 Although it seems that most people enjoy photographing in Manhattan, there were plenty of surrounding areas that made the list. For a place as big as New York City, sometimes it's best to get outside of it and shoot back in. That is particularly true if you want the proverbial skyline shot. There are a few of those on this list, but also plenty of others that proved to be interesting as well. Connecting the boroughs of Manhattan and Brooklyn and spanning the East River at the south end of Manhattan Island is the Brooklyn Bridge. A walk across the Brooklyn Bridge is about one mile and is a great way to see the city from a different perspective as well as the bridge itself. This is one of the oldest bridges of its type in the United States and some stunning photographs can be captured of the bridge's structure day or night. After walking across the bridge, head over to Brooklyn Bridge Park. This is one of the most popular locations for photographing the city's skyline, with the old piers in the water creating a great foreground. I'll admit that when visiting New York in October, for various reasons I never made it down to this part of the city. I would recommend putting this one high on your list of places to visit. It will be at the top on mine for next time. 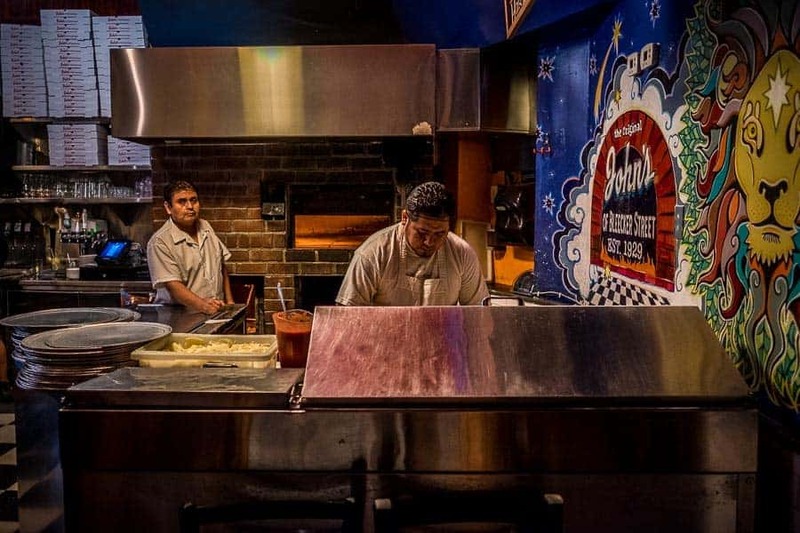 Making pizza at John's of Bleecker Street. Photo by author. DUMBO is short for Down Under the Manhattan Bridge Overpass. You've probably seen the cool photos of the Manhattan Bridge framed by buildings looking down one of the streets of this neighborhood. A good plan may be to walk across the Brooklyn Bridge, continue on to visit this neighborhood, then head to Brooklyn Bridge Park for sunset. However, one of the Improve Photography Podcast Facebook members posted that walking the Brooklyn Bridge could be very crowded at sunset. Another option may be to go early, take some early morning shots of the city skyline, then go to DUMBO. Keep in mind that trying to find the best light still applies, even in New York. That means shooting early and late in the day. Ellis Island played an important historical role in the growth and development of the United States. It was the busiest immigrant inspection station in the country from 1892 until 1954, serving as a gateway for over 12 million immigrants. Many of the original structures remain on the island and tours are available at the immigration museum. The island also affords great views of the New York and New Jersey shores. Liberty State Park is located in New Jersey, just west of Ellis Island. The park provides another great vantage point from which to photograph the skyline of Manhattan. Late in the day would likely be a good time to visit. Give yourself plenty of time to explore the park, then take advantage of the late day golden light. After the sun sets and the lights of the city start to come on would be an excellent time to capture some skyline shots. When you take the ferry to Ellis Island, you will also have a ticket to visit the Statue of Liberty. This one probably doesn't need a lot of introduction. Take a self-guided tour of Liberty Island, then go up into the statue for amazing panoramic views of the city and New York Harbor. Across the Hudson River to the west is Hoboken, New Jersey. A ferry ride across the river near sunset can provide some nice light and good views of the city's skyline from a slightly different perspective. The sky doesn't always cooperate with nice clouds, but it's worth the trip, nevertheless. City view from Hoboken. Photo by author. 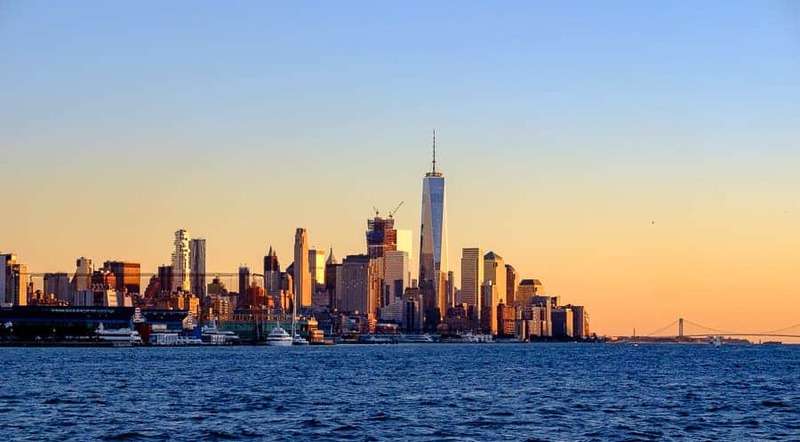 Weehawken is another New Jersey location, just to the north of Hoboken. Hamilton Park is the historic dueling grounds where Alexander Hamilton met his demise at the hands of then sitting Vice President Aaron Burr. Not only is this a place of historical significance, but it is yet another location to capture sweeping views of the skyline across the river. The Manhattan Bridge crosses the East River and connects Lower Manhattan with Downtown Brooklyn. It is a suspension bridge, completed in 1909. The bridge has a pedestrian walkway and interesting photos of the bridge's structure can be made. There are also good views of Chinatown and other parts of the city from the bridge. Think of this as kind of a bonus category. None of these are really location-specific. Let's just say that New York is such an interesting place, you can find something to shoot just about anywhere. 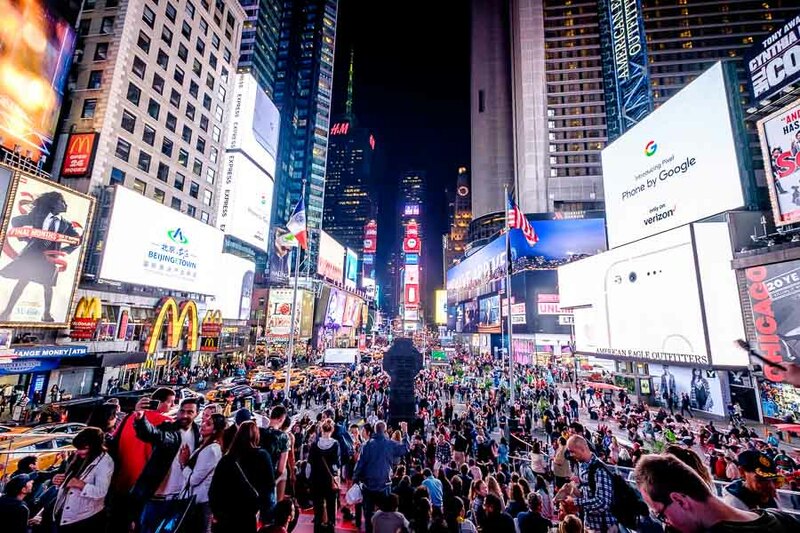 If there is some kind of “performance” that can be done to draw attention, you are likely to see it somewhere and at some time on the streets of New York City. The most obvious, and probably the most prevalent, are musicians. I remember seeing no less that two saxophonists, two drummers, some guitar players, and several people singing during my visit. I'm sure there were many more that I didn't even notice. There are many other things going on and as they say, there's is never a dull moment. Other performers included dancers, magicians, or street ‘preachers'. I also saw many costume wearers. Anything from super heroes, Sesame Street characters, or the Statue of Liberty. Some ‘costumes' consisted only of body paint or underwear. Sorry, no photos. These people are out there to get attention, and they get plenty of it. They expect to be photographed. Some of them also expect to be compensated for being photographed. As many different street performers as there are, there may be three times as many street vendors. There seems to be a cart or stand of some type on about every corner. Most are selling various foods or drinks, but you may also see some with newspapers/periodicals, crafts, or souvenirs. I can imagine that they work long, hard hours in the streets, just trying to make ends meet. They have a lot of character and including them in photos of the city really helps to tell a story. Lining almost every block of the city are dozens of small shops that sell or provide just about any service imaginable. Large box stores or discount outlets are not the norm here. Instead, it is the small ‘mom and pop' shops that make the city, and its diverse neighborhoods, tick. As you walk the streets, take a moment to just peruse the various shops and what they have to offer. You don't even have to go inside. Many of these places have been in the family for generations and exude so much character. New York City is a place where you don't necessarily have to have a plan or even a destination to go shoot. Take a day and just wander the streets around where you are staying. Or take the subway or a bus to go somewhere different. Regardless of where you are, it is pretty much a guarantee you will find something to photograph. Challenge yourself. Street photography may not be ‘your thing', but trying something new or different to you can jump start your creativity. Finally, this article has to end somewhere! I've stated before, but will reiterate the obvious. New York City is an immense place. There is so much going on at all times that it can overload the senses. As a photographer, it can be a challenge to figure out what to capture and how to capture it. But that's part of the fun and, frankly, part of why we all enjoy photography so much. There are no doubt many other locations in and around the city that could have been included on this list. I visited and photographed many of the places that were included here, but there are several that were missed. My plan is to go back some day. If you have any tips, tricks, or photo locations, don't hesitate to let me know.